The following are some of the inspiring stories shared with us about how Love Thoughts have in some way touched the world. Please feel free to share your experiences with us. Just click here. Thanks again for your interest in Love Thoughts. A woman in Jeannie's Coffee Shop was crying about problems with her husband. Jeannie gave a set of Love Thoughts to her and told her to read them and to share them with her husband, for them to talk about the Love Thoughts and then to call Jeannie in two hours. Jeannie reported that the woman and her husband found the Love Thoughts helped heal a difficult time. The couple is doing well. A man keeps Love Thoughts on a nice plate on the kitchen table, then shares them with friends. A school teacher gives Love Thoughts to residents of the senior center in which he volunteers. A man likes to memorize one Love Thought each day, finding that it helps him keep his thoughts focused on good things throughout the day. A tennis instructor has students take a Love Thought before playing. Each student reads a Love Thought aloud and then others make comment. The instructor and the students find this process very uplifting. A hospital employee likes to give out Love Thoughts to coworkers and patients, just for the sake of doing so. A woman who teaches a Bible fellowship gives everyone at the fellowship a Love Thought. They all read the Love Thought and then talk about how their love could grow, feeling uplifted in the process. Before dealing with a difficult matter, a church committee chairwoman gives Love Thoughts out to the committee members and asks them how they might use the Love Thoughts to help the committee best do its business. The chairwoman reports that the results are both loving and powerful. To compliment and support a ministry conference, a church bought twenty sets of Love Thoughts. The ribbons securing a baggie of Love Thoughts were slipped over the neck of a bottle of champagne to decorate an otherwise drab birthday gift. The Love Thoughts transformed the gift to something very special and loving. A famous author and church pastor received a gift of 100 sets of Love Thoughts. The gift came from a woman in Oregon who was moved by the power of the pastor's book and ministry in her life, and she wanted to give something back as a way to show her gratitude. She commented that Love Thoughts were an easy way to reach out to believers and nonbelievers alike. A woman who was taking care of two older customers learned that they had recently lost their son. She gave them Love Thoughts to comfort them. A florist ordered sets of Love Thoughts to be used in special-situation floral presentations. A young woman was primping her hair while driving and swerved enough to gain the notice of a motorcycle policeman, who immediately pulled her over. She had a baggie of Love Thoughts in the car, and while anxiously waiting for the policeman to ticket her, she saw that the Love Thought on top said, "Forgiveness is the greatest and most loving gift of all." She handed the baggie of Love Thoughts to the policeman and said, "Please forgive me." The policeman smiled, gave her only a warning, and handed the Love Thoughts back to her saying, "Here. I think you will probably need these again." She probably will, too. A woman was hosting a baby shower for her daughter and wanted to give something happy, special and loving to each guest. She bought a set of Love Thoughts for each guest, and the Love Thoughts were very well received. Each day, a businessman takes the time to personally address one little padded envelope and insert a set of Love Thoughts. The unsuspecting recipient of the Love Thoughts is on the businessman's mind in a positive and loving way all that day. It is a small way for him to reach out with love to people he knows afar. A retired physician offers Love Thoughts to everyone who comes to his door. A woman hairdresser has a mini-easel on which she places a different Love Thought each day. The Love Thought is a stimulus for conversation of the sort that exceeds the normal topic level. There is a ministry which reaches out to the prison population. The ministry received a gift of 200 sets of Love Thoughts for the purpose of giving one set to each inmate on his or her release. A young man is an outspoken Christian. He did a mission in Norway, and through his efforts, Love Thoughts are now available in Norwegian on the internet. Now he does a street-corner outreach, handing out individual Love Thoughts as gifts to unsuspecting passersby. After an unusually crabby piece by Andy Rooney on CBS's show, Sixty Minutes, Mr. Rooney was sent a baggie of Love Thoughts without any explanation or request for acknowledgment. Love Thoughts seem to be a reasonable remedy for crabbiness. A city employee passed by the reception area in the office where he works. One of the ladies there had just purchased a package of Love Thoughts and was happily sharing them with coworkers. She now has them in a "grab bowl" on her desk so that employees can reach in and get a Love Thought whenever they wish. 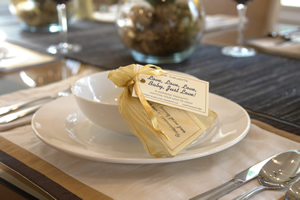 A prestigious law firm received a gift of a box of little golden baggies of Love Thoughts. The donor thought that a law firm probably could use a little love. A private Christian college became familiar with Love Thoughts and ordered them to be available for purchase in its book store. An elegant bed and breakfast overlooking the Sound and the lights of Victoria ordered Love Thoughts to serve both as gifts and as conversation pieces for its guests. A donor gave little golden baggies of Love Thoughts to supporters of a local charity during a fundraiser for the organization. "Wow! for free?? No Way!!" "This makes me so happy!" "This is so cool!" I am a counseling intern at a local mental health agency in Flagstaff. A dear friend gave me a golden bag full of your love thought cards that I held on to for a couple of years not knowing what to do with them except enjoy reading...until recently. I have used them to initiate conversations in groups I run about forgiveness and I have used them in therapy sessions to encourage some clients to challenge their "mental prisons." I leave them in a pretty dish next to the chair my clients sit in. Many take one with them now after coming in for a session. I love them and so do my clients!! I get so many comments about them. They encourage love, forgiveness, and compassion. I plan on buying more, and always keeping my dish full.